As a Manchester United supporter, this fiasco has been hard to take. Despite not scoring a goal from open play since March of last year, he is our best player and the heart and soul of the team. But this is not the first time he has tested the patience his fans. At 16 (still at his boyhood club, Everton) he was pictured outside a brothel. At the World Cup, he berated England’s fans on live TV, while walking off the pitch after a disappointing draw. Late this summer, he was pictured urinating in the street after a night of heavy smoking and drinking. In fact, he makes no effort to hide his cravings and is often pictured with both a pint and a cigarette. This is hardly the behavior one would want to see from el blanco pele (as some Manchester United fans have called him), the savior of English football. Finally, earlier this season he admitted to seeing a prostitute on multiple occasions while his wife (a childhood sweetheart) was pregnant with their first child. To be honest, I was willing to turn a blind eye to these disgusting actions, as his private life was not affecting his form on the pitch. It didn’t really matter that I didn’t respect him as a person, as long as it wasn’t affecting the team. However, his actions this past week have been a step too far. It is true that the mastermind behind this entire operation is Rooney’s agent, Paul Stretford. But to lay blame solely on him, as many pundits and fans have done, is naïve. 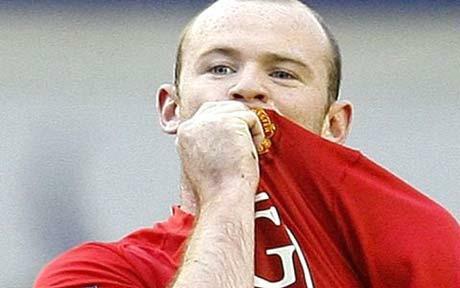 Rooney ultimately put his name to an announcement that degraded the club, his teammates and the fans, which will forever tarnish his reputation as a Manchester United legend. There have been understandable murmurs of discontent coming from the dressing room, most audibly from Patrice Evra who stated, “If one player in the team does not trust the others, he should not play in the team.” Evra must not be alone in doubting Rooney’s confidence in the rest of the squad. But it is the damage done to the fans that is most likely going to be the hardest to repair. This is saying something, as Manchester United fans are notorious for sticking up for their players while the rest of the country portrays them as scapegoats (see David Beckham after World Cup 1998 and Cristiano Ronaldo after World Cup 2006). When he scores, I’ll be happy and when he plays well, I’ll be pleased. I want him to do well only but only because it will help the team. His return from an ankle injury has been tentatively penciled in for the Manchester derby in two weeks time. The reception he receives should be a poor, but since he’ll be collecting £200,000, will he really care? This entry was posted on Sunday, October 31st, 2010 at 6:44 pm and is filed under Uncategorized. You can follow any responses to this entry through the RSS 2.0 feed. You can leave a response, or trackback from your own site.